NCC: Carbon and wetlands: So what's the big deal? 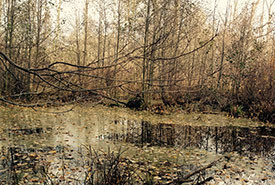 Wetlands can support a lot of plants and vegetation, which take up carbon from the atmosphere. What's unique about wetlands is that they enable dead plant material and the carbon they contain to be buried in their soils without being released into the atmosphere or transported elsewhere. 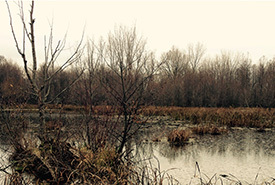 Northern wetlands can be thousands of years old (even more than 10,000 years old! ), which means that they have potential to hold a lot of carbon in their soils. For example, peatlands (lands with peat at the surface) are highly space-effective carbon stocks: they cover only three per cent of the land, but contain more carbon than the entire forest biomass of the world. But there is a caveat: wetlands simultaneously release methane (a potent greenhouse gas) while carbon is taken up by plants and stored in their soils. Methane is released from wetlands when oxygen is not readily available and is a potent atmospheric greenhouse gas that radiates heat back to Earth. Over centuries and millennia, carbon uptake can outweigh methane and carbon releases from wetlands. However, there is concern that carbon balances may drastically shift under human-induced climate change, and could increase carbon and methane releases to the atmosphere. What happens when a wetland is drained due to human activities? Unfortunately, the carbon stores become exposed to oxygen, and may be released as carbon dioxide into the atmosphere. This, in turn, traps more heat and contributes to global temperature increases. It is unknown how restored wetlands can play a role in carbon storage and help compensate for the loss of carbon in natural wetlands when they are altered or lost. To answer these questions, I will be studying carbon dynamics in marshes and restored wetlands and their capacity to hold carbon in their soils, both now and in the future. 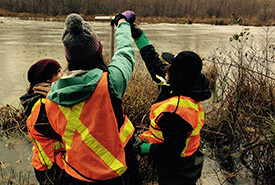 My work will contribute to understanding how wetlands affect the global climate, and will help organizations like the Nature Conservancy of Canada improve strategies for wetland conservation and restoration. Amanda Loder is a graduate student at the University of Toronto in the Paleoecology Laboratory, and studies carbon stores in marsh soils and their role in the global carbon cycle and moderating the climate. Read more about Amanda Loder.